The Netbox 4K is a vast improvement on the Netbox HD, with a far better UI and support for Dolby Atmos – but given the omission of Netflix, it still hasn’t quite reached streaming perfection. Although more of us are buying smart TVs than ever, their often unintuitive user interfaces means that there’s still a need for streaming boxes that give you access to all your favorite platforms in one place. Enter the Netgem Netbox 4K. 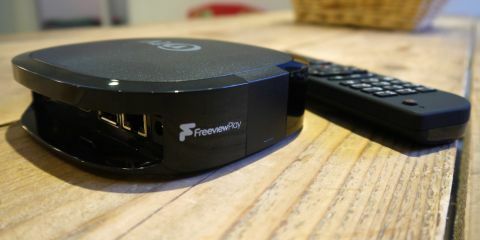 Netgem has been on the streaming box scene for a little while now, and its latest streaming box, the Netbox 4K, and its accompanying 4K-enabled subscription service hope to make streaming accessible for everyone. When we tried out its predecessor, the Netbox HD, we were impressed with the amount of services (including live TV) we could access through one system, but found the user interface to be too laggy to recommend. Here’s what we thought of the all new version. The Netbox 4K is available to purchase for £149.99, around £20 more than the Netbox HD. The £149.99 is fairly expensive compared to similar streaming devices; for example, the Chromecast Ultra costs around £69 and the Amazon 4K TV Stick retails for £49.99. However, these less expensive streaming dongles don’t allow you to watch live TV like the Netbox 4K does, which could explain the vast difference in price. The Netbox 4K looks like...well, a box. And a very nice box at that. Small and compact, the Netbox 4K is designed to blend in seamlessly with the rest of your entertainment system, meaning it won’t take up precious room on your TV stand or cabinet. This time around, Netgem has swapped the angular style of the Netbox HD for a more attractive rounded look, with HDMI, ethernet, RF antenna, USB, and S/PDIF (digital audio) ports in the back. The included cables, while useful, are long and cumbersome – if you hate trailing cables you may want to opt for a streaming dongle like the Google Chromecast or Amazon Fire TV Stick. The front of streaming box also features a thin LED that indicates when the Netbox 4K is powered on. It comes with a remote control, featuring a handy button for Freeview Play, which immediately open the app when pressed, meaning you don’t have to trawl through the menu to find what you want to watch. Unlike the Netbox HD, the remote for the newer model doesn’t include a dedicated Amazon Prime Video button or an Alexa voice search button – the Netbox 4K does have the Amazon Prime app, and supports Alexa (as long as you have an Echo speaker to communicate with it) though. Setting up the Netbox 4K is a completely seamless experience, far easier than setting up its predecessor – simply connect to the internet via WiFi or the included ethernet cables. From there, the Netbox 4K takes you through the setup process, where you can add parental controls and scan for Freeview channels. The user interface is far more intuitive than the Netbox HD, and far quicker to respond the the remote control, which makes it easy to use and navigate through the various apps and channels. However, it did occasionally lag, especially when pausing live TV; on one occasion, the Netbox 4K stopped working for five minutes in total, which was pretty frustrating – this could particularly be an issue if you want to pause a show at a crucial moment. As well as pausing live TV, you can also record shows to watch later using an external USB stick or hard drive, which is included in the box. If you’re not a fan of the included remote control, you can also scroll through the content, watch shows, cast content to your TV, and control the Netbox 4K using the smartphone app, giving you plenty of options for watching TV on the go and at home. Along with the new streaming box, Netgem has released the new Netgem 4K streaming platform with a brand new layout. Instead of organizing content by each app or platform, content is now organized by relevance and genre. One benefit of this new layout is that you’re exposed to content you may not have originally sought out; for example, in the movie section of the app we found lots of films hosted on BBC iPlayer, which is somewhere you may not have initially thought to look for films. Although the improved user interface feels a lot easier to navigate, we did find that some of the categorization wasn’t always accurate. One example of this is the ‘teen’ category, which included the adult animation Archer. While this show may be suitable for older teenagers, it’s probably a little rude for younger teens. If you have children, you may want to keep a closer eye on the type of content they are able to access through the service. The Netgem 4K app has a good variety of streaming and on demand platforms available, including Amazon Prime Video, BBC iPlayer, ITV Hub, All 4, My5, UKTV Play and Rakuten TV – this is on top of over 100 Freeview channels. It’s worth remembering that many of these services will require you to sign up before you are able to use them, so it’s a good idea to do this on your laptop or smartphone ahead of time so you can get watching right away. A fantastic new addition to Netgem is YouTube, but if you're a fan of Netflix shows like The Chilling Adventures of Sabrina or Bojack Horseman you may be disappointed – the new NetBox 4K doesn't support Netflix at all. Another new feature of the Netbox 4K is that it supports Dolby Atmos sound, which means you can recreate the cinematic experience at home (as long as you have compatible Dolby Atmos speakers or a soundbar). Although Alexa-powered voice search and control is supported by Netgem, you will need an Echo speaker to make voice commands – this is useful, but it would be great if the Netbox 4K came with Alexa built in. Overall, the Netbox 4K is a vast improvement on the Netbox HD in terms of design and user interface, and we liked the updated layout of the Netgem app. The categorization of content was generally pretty good, although parents may want to keep an eye on the content Netgem suggests for teens in particular – or perhaps consider setting up a parental lock. Although the inclusion of YouTube in Netgem’s app lineup is a step in the right direction, there’s still a Netflix-shaped hole in the service, and for some users that’s going to be a deal breaker. If you are a Netflix devotee you may need to complement your setup with the Google Chromecast for example, which at a quarter of the price, houses far more apps and higher quality content – still, Chromecast doesn’t allow you to watch live TV, which is a huge selling point of the Netbox 4K. So, if you’re not a dedicated Netflix fan, you’ll probably be satisfied with the selection of services on offer, and the Netbox 4K is a fantastic way of bringing them all together in one place, with an easy-to-use interface that makes streaming accessible for even the biggest technophobes. In terms of price, it’s not the cheapest streaming device available, but if you're looking to have all your entertainment option in one place, you may find it worthwhile to choose the Netbox 4K over competitors that don’t support live TV.